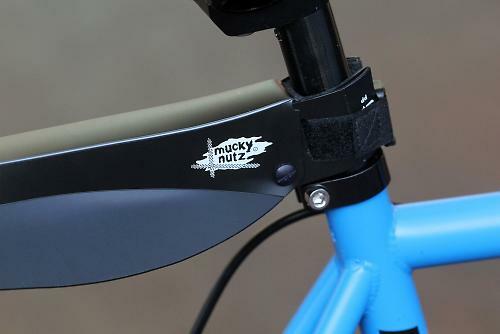 Mucky Nutz make some great, lightweight mudguards - check out the their Face Fender and Gut Fender ranges. The Rear Fender isn't one of them though. It is lightweight at 75g; it just isn't great. The problem is the way that the Rear Fender attaches. The guard's flexible polypropylene material forms a U-shape where it fits to the seatpost. The U-shape is backed with rubber foam 'to prevent slippage', and a velcro strap holds it in place on the post. Mucky Nutz say it 'won't slip around the seatpost'. It absolutely will, and often. I mostly tested it on a Kinesis Tripster ATR, on road and off, and pretty much every time I got off the bike I had to adjust it, as it had rotated from its six o'clock position directly behind me and over the rear wheel to five o'clock or seven o'clock, or worse. The underside of the guard had mud on it, like my backside, so it was doing something. It just wasn't doing it all of the time. This isn't a problem unique to the Mucky Nutz Rear Fender. Every strap-on mudguard I have used has exhibited the same problem. I've snapped ratchets on those that have them, trying and failing to get them tight enough. The only quick-release seatpost-fixing guard I've used that has properly stayed in place is Zefal's Swan Road Mudguard. There is another way to fit the Rear Fender, however. 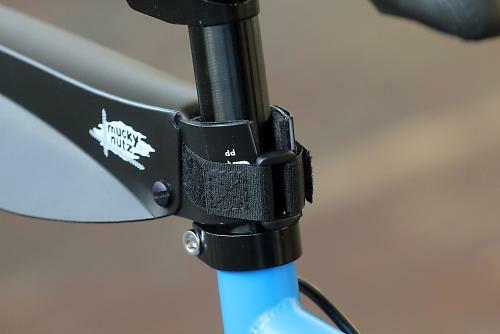 If you've got a space of about 5x3cm in the small triangle formed by the seat-stays and the seat-stay bridge, you can strap the Rear Fender to the top of the seat tube. (While the guard is wider than 3cm, it can be pinched inwards as it's flexible.) The seat-stays will then stop the Rear Fender rotating. I could get it on my 56cm fixed wheel bike like that, but the others had frames - generally 54cm or smaller - that were too compact or lacked the space between the seat-stays. But for bikes that are big enough, it's a good option. Most purchasers will end up fixing it to the seatpost, I reckon, and there it's performance is underwhelming. A Zefal Swan guard will do a better job for road bikes or cross bikes, and a Crud Raceguard or Mudhugger Rear will do a better job on mountain bikes. * At 75g it is the lightest adjustable rear mudguard available. * Compatible with dropper seatposts. Attach to seatpost or seat tube. * Can be a permanent or temp item. Leave it on or fold flat, roll up and put it away. * Won't slip around the seatpost. Has a rubber foam contact to prevent slippage. I say: it definitely will slip around the seatpost. Lightweight, durable plastic. Poor, velcro-strap fixing. Better than nothing. Not as good as other rear guards. Springs back into shape easily. Probably the lightest rear guard of this type and size available. I'd only recommend it if you've got a bike big enough that it could fitted to the seat tube, or if you're prepared to bodge a more secure fit with cable ties... and probably glue. http://road.cc/content/review/147433-rrp-rear-guard would seem a better solution. The thing is though a wet bum will dry and clothes get put in the wash, but it is much more of a chore to clean/lubricate your front derailleur, chain, cassette and jockey wheels after a wet ride. So even if this and other such products scored a 10 out of 10, the bike remains unprotected. It would be good to see some unobtrusive lightweight products aimed at protecting the groupset (not that this product is particularly unintrusive). Cut a short length of old inner tube, slip it over the seat post, and attach the guard. Hey presto! This and any other similar product will not rotate and will work properly.